It’s 8:30 am, rush hour along the cycle path that lines the avenue surrounding Seville’s historic centre. A crowd of cyclists cram the track on their way to work, to school or to their daily activities. Almost none of them wear Lycra garments nor other special clothing. Many women and children are pedaling on their bikes, while some parents transport their kids on bike seats: they are on their way to primary school. This scene has been a regular sight in Seville since 2008, when the use of the bicycle boomed in the southern Spanish city. At its peak in 2011, the city’s 700,000 inhabitants took some 72,000 trips per day. Only five years earlier, the cycling path was a parking lane for cars. 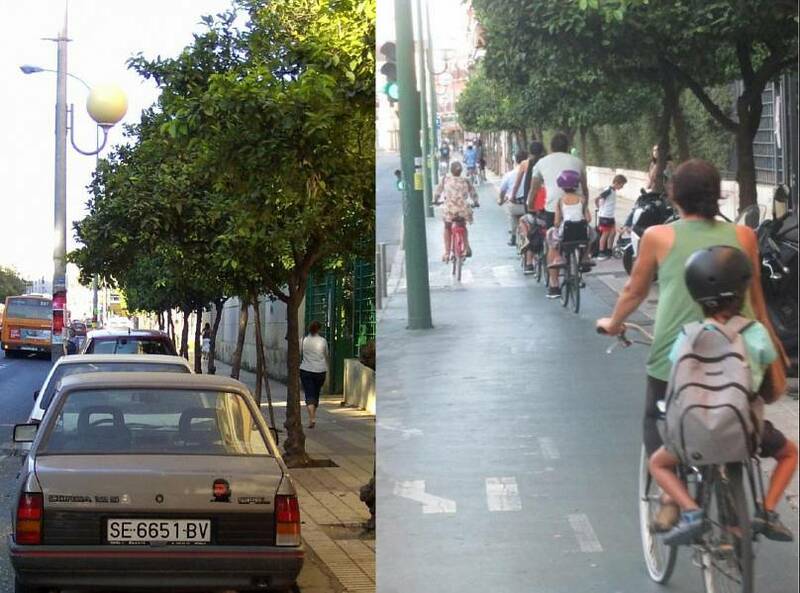 One of the most used cycle paths in Seville, currently (right) and in 2005 (left), before the construction of the network of cycle paths.Photographs: Archive of the Municipality of Seville and R. Marqués. Amid the mass movement of people to urban areas and growing concerns over climate change, cities worldwide are searching for sustainable mobility solutions to keep their neighbourhoods liveable and their communities healthy. And yet, in some places, cycling has become a surprisingly controversial activity due to resistance from the status quo and accusations that it drives gentrification, benefitting the wealthy while leaving others behind. On the contrary, the success we’ve had in Seville shows that cycling reforms can be made quickly and improve the lives of all members of the community. This small "miracle" emerged from a decision by the municipal government, at the time in the hands of a coalition between the socialist party (PSOE) and a leftist platform (Izquierda Unida). It built a Dutch-style network of cycle paths, separated from motorised traffic and covering the entire city, as part of a project designed to integrate bicycles in urban mobility. In just five years, Seville’s cycling infrastructure expanded from 12 km of unconnected cycle paths in 2005, to 120 km of bike lanes, separated from traffic, in 2010. Most of them were bidirectional, and built on former parking lanes but raised at the level of the sidewalk. This made it safer for cyclists and harder for subsequent goverments to turn the path back into parking. The result was a network of cycle lanes that forever changed the landscape of the city. Plans were made to extend and increase the density of the network, which now covers 180 km. To encourage more bike use and offer alternatives to private bikes and public transit, a bike-sharing system was also introduced in 2007, with 2,500 bicycles in 250 dock stations uniformly spread throughout the city. As a result of the implementation of these policies, the use of bicycles increased more than fivefold, from approximately 13,000 daily trips in 2006 to 72,000 in 2011, a figure that has remained relatively constant, albeit with ups and downs, to the present. Bicycle promotion was not an isolated policy - it was included in a wider programme that aimed to encourage all kinds of active mobility, including the creation of numerous pedestrian zones in key streets and avenues mainly located in the historic centre. 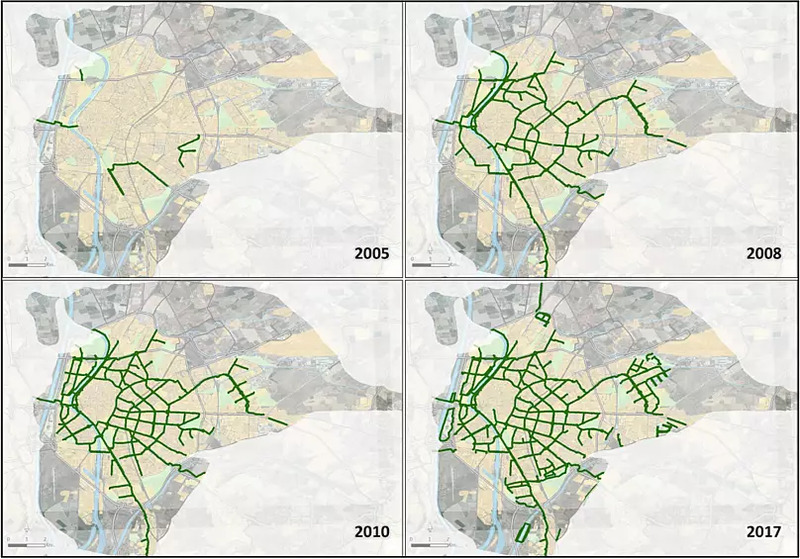 Evolution of the network of cycle paths in Seville.Source: Municipality of Seville. We wanted cycling to be more than a leisure activity, and part of residents’ everyday lives. On-site counts and surveys showed that the majority of journeys on a workday were for daily commuting, such as going to work (31%) or to school (26%), with a fairly homogeneous spatial distribution between the city centre and the periphery, and with an age distribution very similar to that of the city, except for the older age segment (over 64 years). Over time, more and more women have taken to the cycle track. 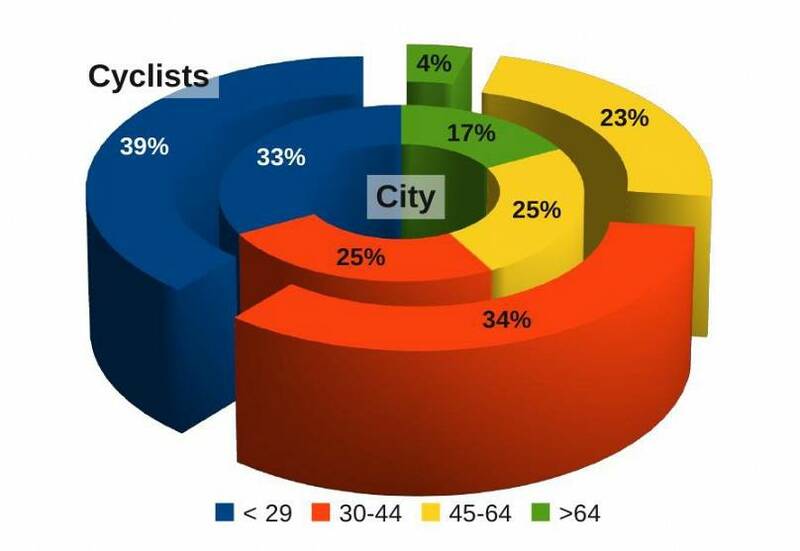 In 2006, 25% of the 13,000 cyclists riding daily through the city were women. At the last count, in 2017, it was 36%. Thus confirming one of the best established rules of urban cycling: the more the cyclists, the higher the percentage of women among them. The strong willpower of the city council was instrumental, but the role of the grassroots shouldn’t be underestimated. In 1987 a group of urban cyclists, who were concerned about traffic congestion and pollution in Seville's centre, founded the association "A Contramano: Asamblea de Ciclistas de Sevilla" to specifically call for a network of cycle paths separated from city’s traffic. Since then, many popular bike demonstrations have taken place. The largest one, in 1993, brought together 10,000 people. At the same time, numerous proposals were made from the cyclists' association, asking for the inclusion of a network of cycle paths in the urban plan of the city. This was achieved in 2006, when the City Council approved the Urban Plan for the City and then the Bicycle Plan of Seville 2007-2010, which supported the implementation of the cycling infrastructure. The three of us, along with many other people from "A Contramano" participated in this process. It hasn’t always been smooth sailing. In 2011, a change in the local government caused a slowdown in bicycle promotion policies, turning to a car-oriented mobility policy. But it is impossible to dismantle infrastructure that is used by more than 70,000 people daily. The use of bicycles remained, although with a small decrease, during the period 2011-2015. More recently, with the return of bicycle promotion policies and the drafting of a new Bicycle Plan, cycling is again on the rise. This new Plan is not limited to cycle paths, but includes plans for building safe bicycle parking infrastructure in neighborhood communities, workplaces, schools and public transport stations, which are highly demanded by cyclists. 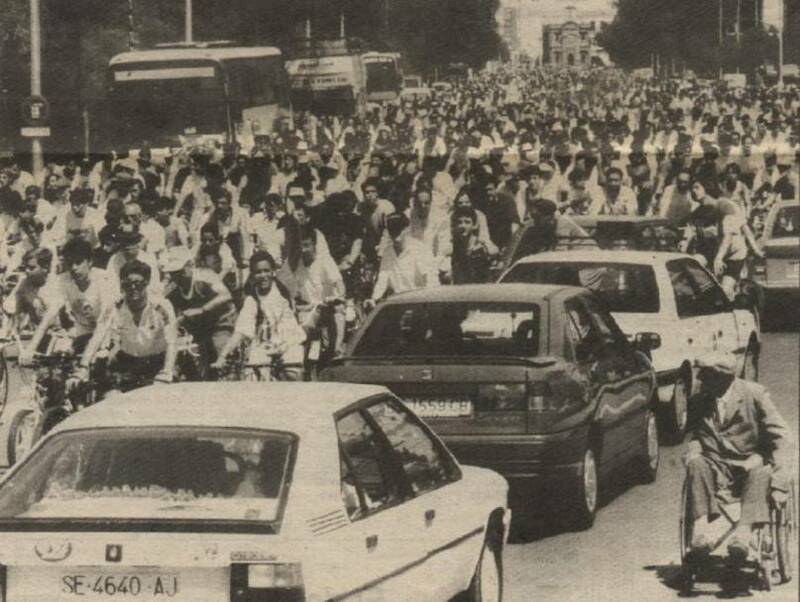 Press clipping showing a bike demonstration in Seville in demand of cycle paths organised by "A Contramano" (1993).Photograph: Miguel Mesa ("El Correo de Andalucía"). The experience of Seville has shown that the implementation of a network of cycle paths separated from motorised traffic can very effectively boost urban cycling, making cycling a normal activity and integrated into the daily life of the city, without making a distinction between age, gender or social activity. The conjunction of a strong citizen movement with an equally strong political will is of great help. And when supported by the appropriate infrastructure, urban cycling can be very resilient against political change. With bicycles already a part of our urban culture, all the debates around active and sustainable mobility are easier in the city. When there is political will and processes of change are set in motion, citizens respond positively. This idea is vital at a time when tackling the challenges arising from the fight against climate change and dependence on fossil fuels are becoming increasingly important. Ricardo Marqués is Professor of Physics at the University of Seville and was the President of the local cyclists' association "A Contramano" until 2012. Jose A. García-Cebrián is a specialist lawyer in Urbanism and was the Director of the Bicycle Plan of Seville 2007-2010. Manuel Calvo-Salazar is an ecologist and independent consultant, he participated in the design of the basic cycling network for Seville (2005), was in the team that wrote the first Bicycle Master Plan (2007) and coordinated the preparation of the current Bicycle Program of Seville (2017). Since 2011 all of them collaborate in the research, dissemination and development of bicycle mobility in Seville and other cities. Immersive story: Can wine consumption really save the environment?